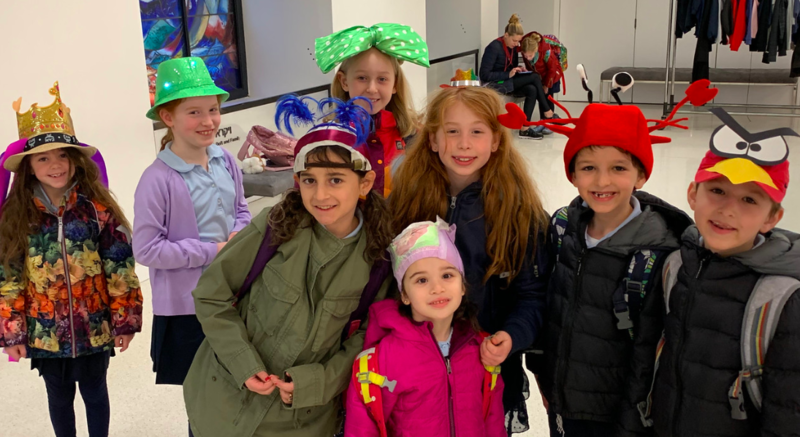 Ramaz Crazy Hat and Swag Day – What a Kickoff to the Adar Season! Adar is coming - we're so happy! Well, at least that is the song that plays in our heads every time that Rosh Chodesh Adar arrives. The excitement around Purim, the Megillah, costumes, Mishloach Manot and Matanot L'Evyonim, sweeps students up the first time they hear a song with Adar in it. This year, double dipping is allowed! Students get to enjoy two months of Adar as this year is a Jewish leap year ensuring that Pesach will fall out in the summer (after all, it is called Chag HaAviv, the Spring Holiday). For the first round of Rosh Chodesh Adar 1, the entire LS brought out the creativity and school pride on Crazy Hat Day and Ramaz Swag Day. The students came up will unique ways of expressing their excitement and imagination for each of these special days. As is learned from the Rambam (Maimonides) happiness and joy is not complete unless we have the chance to share it with others. On Tuesday, the MS students came to pump up the LS sprit - singing and dancing with each of 3rd grade class. Yesterday, the 4th grade joined the MS for a special Rosh Chodesh Adar 1 Staff vs. Student All-Star basketball game. The students were excited to cheer on Mr. S as he represented the LS, as well as their older peers, as they tried to sink a half court shot for a chance to win a special snack after the break!